One of America’s most exciting cities is giving rise to a vibrant new center. Miami World Center brings a new energy to Miami. The Miami World Center is a nine block mixed-use development immediately north of the Central Business District in downtown Miami. It is defined by NE 2nd Avenue to the east, North Miami Avenue to the west, NE 11th Street to the north, and NE 6th Street to the south. 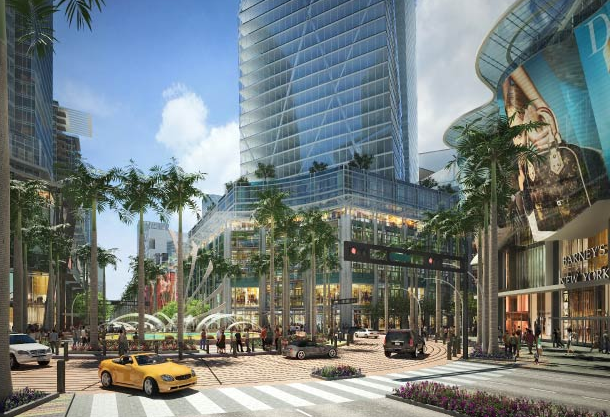 Spanning over twenty five acres, the Miami World Center includes a dynamic mix of retail, residential, office, and institutional uses. It will create a vibrant, walkable pedestrian environment with a unique sense of place: a modern design statement driven by Miami’s unique physical context, culture, and architectural heritage. An unprecedented assemblage of almost 30 acres has been meticulously amassed in the core of one of America’s most electrifying cities. An assemblage that is surrounded by world-class amenities. An assemblage that is connected by every means of transportation possible to everything that matters. At this point in time, there are only a few opportunities around the globe that allow for such a city-redefining project. And now, brought to this assemblage, is a vision so epic that it will forever change the City of Miami. This vibrant new epicenter to live, work, and play — and a magnetic destination for visitors from all over the world — will bring together a compelling and unique blend of exceptional entertainment, retail, residential, and commercial offerings in one thriving location, elevating Miami to a truly global city.